Celebrate the Olympics with ICJUK. The 2012 Summer Olympics start on July 27th, and if you’re not lucky enough to witness it in person you can still show your support thanks to ICJUK. 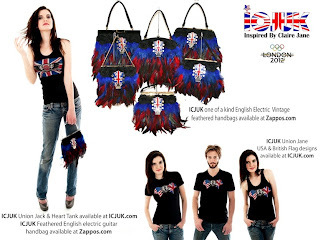 You can easily show your Olympic pride by rockin’ an ICJUK Union Jack & Heart Tank or a Union Jane USA & British Flag Tee. Or, you can accessorize with a fashionable ICJUK one-of-a-kind English Electric Guitar feathered handbag (available exclusively at Zappos.com). Looking for something with a little edge? Then how about the super cool Skulls Galore Tee? Love Claire Jane. She does quality work and is a wonderful lady. Great job CJ.